Household exposure to persons with acute HBV infection. CONTRAINDICATIONS: Individuals known to have severe, potentially life-threatening reaction to human globulin preparations should not receive HepaGam B® or any other immune globulin (human). Individuals who are deficient in IgA may have the potential to develop IgA antibodies and have severe, potentially life-threatening allergic reactions. For post-exposure prophylaxis indications, HepaGam B® must be administered intramuscularly only. In patients who have severe thrombocytopenia or any coagulation disorder that would contraindicate intramuscular injections, HepaGam B® should be given only if the expected benefits outweigh the potential risks. 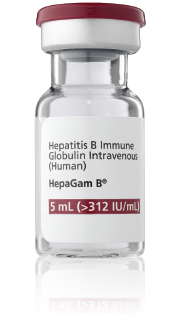 WARNINGS and PRECAUTIONS: HepaGam B® [Hepatitis B Immune Globulin Intravenous (Human)] is a sterile solution of gamma globulin (IgG) made from human plasma. Products made from human plasma may carry a risk of transmitting infectious agents, eg, viruses and, theoretically, the Creutzfeldt-Jacob disease (CJD) agent. Thrombotic events have been reported in association with the use of immune globulins. Patients at risk include those with a history of atherosclerosis, multiple cardiovascular risk factors, advanced age, impaired cardiac output, coagulation disorders, prolonged periods of immobilization, and/or known/suspected hyperviscosity. The maltose contained in HepaGam B® can interfere with some types of blood glucose monitoring systems. Only testing systems that are glucose-specific should be used in patients receiving HepaGam B®. This interference can result in falsely elevated glucose readings that can lead to untreated hypoglycemia or to inappropriate insulin administration, resulting in life-threatening hypoglycemia. Liver transplant patients should be monitored regularly for serum anti-HBs antibody levels. Certain adverse drug reactions may be related to the rate of infusion. The recommended infusion rate must be closely followed. Patients must be closely monitored and carefully observed for any symptoms throughout the infusion period and immediately following an infusion. The most common adverse drug reactions observed in clinical trial subjects were hypotension and nausea (2% of clinical trial subjects). For product inquiries about HepaGam B®, call (877) 437-2426. Please see full Prescribing Information for full prescribing details.